One could be forgiven for wondering where Airbus suddenly got a completely new model, the A220, from. Normally new aircraft models are years in the planning, designing and marketing. We normally read or hear about them as their progress toward commercial service comes closer. The A220 is obviously a departure from the normal naming convention adopted by Airbus since their first success story the A300. So where did the A220 come from? A Swiss Bombardier CSeries CS100_(HB-JBA) at Frankfurt Airport. 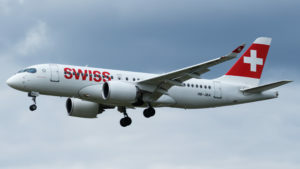 Swiss was the launch customer for CS100 and once steep approach certification was granted, flew this aircraft into London City Airport. mass transportation equipment, saw a place in the market for a larger jet than it’s current CRJ (Canadair Regional Jet) offering. Around this time, Dutch aircraft manufacturer Fokker was in financial trouble and Bombardier began an investigation into the possibility of an acquisition of Fokker on 05 February 1996 with a view to gaining access to Fokker’s F-100. By 27 February of the same year, Bombardier determined it was not in their interests to proceed with the acquisition and on 15 March 1996 Fokker went bankrupt. Deciding to go it alone, Bombardier on 08 September 1998 launched the BRJ-X project. BRJ-X which stood for Bombardier Regional Jet Expansion was to be an aircraft that fitted between the CRJ and the smallest of the bigger jets. The bigger jets were namely, the 2×3 seat configuration jets such as DC9 / MD80 / Boeing 717 and 3×3 seat configuration jets such as the Airbus A318 / Boeing 737-500 / 737-600. The BRJ-X would have under-wing engine pods as opposed to the CRJ which has rear fuselage mounted engines. Seating for the BRJ-X would be in the 85-100 range and the project would launch in 2003. By the end of 2000, however, Bombardier had all but shelved the BRJ-X plan in favour of stretching the CRJ-700 to the CRJ-900. At the same time, Airbus had launched the Airbus A318, the smallest member of the A320 family, Boeing had launched the 737-600NG and Embraer of Brazil had launched their E-Jet series. 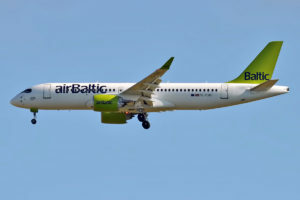 Air Baltic was the launch customer for the Bombardier CS300. On 08 March 2004, Bombardier began a new feasibility study into the C Series jet. There would be two variants, one for a 110-115 seat aircraft and the other for 130-135 seats. The range would be around 3,200 nautical miles(NM) and the seat configuration would be 2×3, that is two seats on one side of the aisle and 3 on the other. The C Series aimed to replace the aging DC9 / MD80, Fokker 100, Boeing 737 Classic and BAe 146. It would feature a cabin with enough headroom to stand up, side stick flight controls and fly by wire technology. As was becoming the norm in those days, 20% of the materials would be composite with the advantage of lighter weight yet high strength. The plan was for a first flight in 2008 and entry into commercial service in 2010. 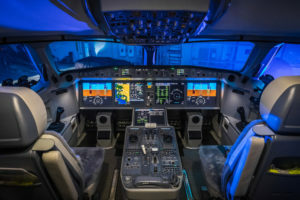 Air Baltic’s Bombardier CS300 cockpit featuring side stick control and full glass panel. In May 2005, the development of the C Series jet was estimated to be US$2.1 Billion. The main investors were the Government of Canada, the Government of Québec and the Government of the United Kingdom. The last may seem a little strange until you realise that part of the Government of the United Kingdom deal was that the wings, engine nacelles and the composite parts of the empennage would be manufactured in Belfast, Northern Ireland. This wasn’t too much of a stretch as Bombardier already owned a factory in Belfast which they acquired when they bought Shorts Brothers in 1989. …… Bombardier already owned a factory in Belfast…. The cabin was designed to be attractive to the traveller, with broader seats and armrests for the centre seat. The windows were also larger than normal so that natural light would be available to all. Things looked all set to go, but there were still some ups and downs ahead. See the timeline below for a clearer picture. 31 Jan ’06 Bombardier announced that the current market did not warrant a launch of this magnitude and company focus would be redirected. A small team was left to continue working the business case. Bombardier announced that work would once again begin on the C Series. Nov ’07 Bombardier chose the Pratt and Whitney geared turbo fan PW1000G rated at 23,000lb (102kN) for the C Series. 22 Feb ’08 Bombardier’s board authorised formal sales proposals of the C Series. It would be sold as having a 20% improved fuel burn and 15% better cash operating costs than current offerings on the market. Qatar, Lufthansa and ILFC expressed their interest. Final Assembly – Mirabel, Montreal, Québec. Wings – Belfast, Northern Ireland. Aft fuselage and cockpit – St. Laurent, Québec. Main Fuselage – China Aviation Industry Corporate (AVIC)’s affiliate Shenyang Aircraft Corporate. Mar ’09 Bombardier changed the aircraft designation from C110 to CS100 and C130 to CS300. There were to be some extra options for the CS300, namely the XT for Extra thrust and ER for Extended Range. These options were dropped with the ER configuration becoming the standard offering for the CS300. 07 Mar ’13 The first almost completed airframe was put on display. 30 Aug ’13 Transport Canada gives a approval for high speed taxi testing. 16 Sep ’13 Maiden flight of the CS100 from Montreal’s Mirabel Airport. 29 May ’14 Uncontained engine failure suspends further testing until the cause and resolution are found. This caused Bombardier to miss Farnborough 2014 which was critical for show casing the new aircraft. 07 Sep ’14 Flight testing resumed once a lubrication problem had been found and corrected in the engines. 20 Feb ’15 CS100 test aircraft completed 1,000 test flying hours. 27 Feb ’15 The CS300 makes its maiden flight from Montreal’s Mirabel Airport. Initial findings were that the aircraft exceeded expectations on noise, performance, economic guarantees and possibly even a greater than expected range. Jun ’15 At the Paris Air Show Bombardier released updated specs which showed many improvements over the original specs. Nov ’15 All certification tests for the CS100 were completed. 25 Nov ’15 First phase of route testing is completed with the CS100 achieving 100% dispatch reliability. 18 Dec ’15 Transport Canada awards type certification for the Bombardier CS100. Jun ’15 Type certification is awarded by the F.A.A. and E.A.S.A. for the CS100. 29 Jun 16 In a handover ceremony at Montreal’s Mirabel Airport, Swiss Global Airlines received their first Bombardier CS100. 11 Jul ’16 Transport Canada awards type certification for the CS300. 15 Jul ’16 Swiss commence their first commercial service with the CS100 from Zurich to Paris. 23 Nov ’16 Transport Canada and E.A.S.A. award common rated certification to both the CS100 and CS300. This means that pilots qualified on one are also qualified on the other which saves airlines a lot of extra pilot training hours. 28 Nov ’16 The first CS300 is delivered to Air Baltic. 14 Dec ’16 The CS300 receives type certification from the F.A.A..
14 Dec ’16 Air Baltic perform the first commercial service with the CS300 from Riga to Amsterdam. Mar ’17 Steep landing approach tests (5.5 degrees) were conducted by the CS100 at London City Airport (LCY). The CS100 was the largest aircraft to have landed at LCY. Apr ’17 Transport Canada and E.A.S.A. awarded certification to the CS100 for steep approaches. 08 Aug ’17 Swiss fly the first commercial service of a CS100 from Zurich to London City Airport, taking advantage of the newly acquired steep approach certification. 16 Oct ’17 Bombardier form a partnership around the C Series programme. The shareholding is Airbus 50.1%, Bombardier 31% and Investissement Québec 19%. 01 Jul ’18 Bombardier and Airbus announce that Airbus will have majority stake-holding in the partnership. 10 Jul ’18 The C Series jets were renamed to be in line with Airbus’s offerings. 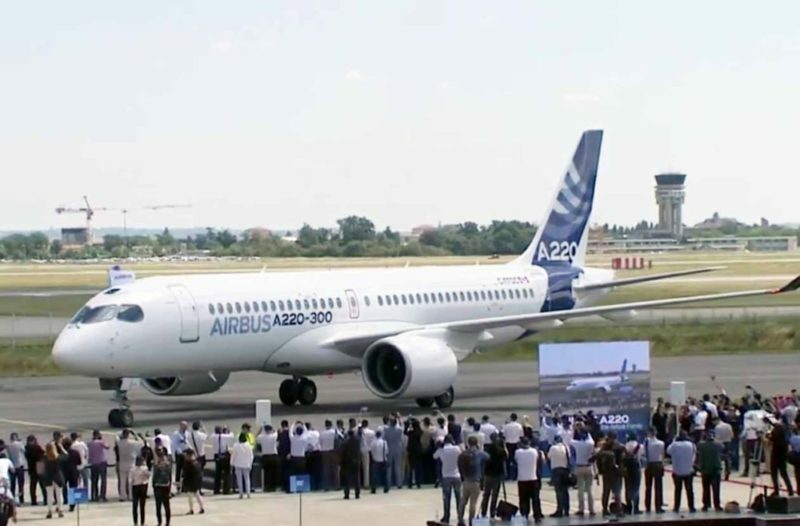 The CS100 was renamed to be the A220-100 and the CS300 became the A220-300. 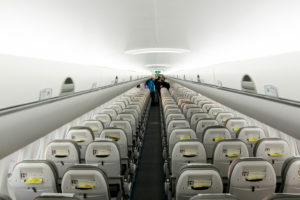 A view of the Bombardier CSeries CS 100 cabin. Note the 2×3 seat configuration. When the C Series was launched by Bombardier, they estimated that the target market, the 100-149 seat market, would account for 6,300 units over 20 years. This translates to an estimated value of US$250B. Bombardier’s business case saw them capturing half of that. Airbus’s buy into the partnership would indicate that they agree with this estimate and see a profitable future for the A220. Their main competition of course is Brazilian aircraft maker Embraer with their E-Jet series. It will be interesting to see how competition fares between the two. February 2019: Four new orders for the A220 were taken in February. Boasting the first A220s for the South Pacific, the orders were made by Air Vanuatu comprising of two A220-100s and two A220-300s. The Airbus A220 story is a growing one. If you have any first hand experience with this aircraft or questions please don’t hesitate comment below.